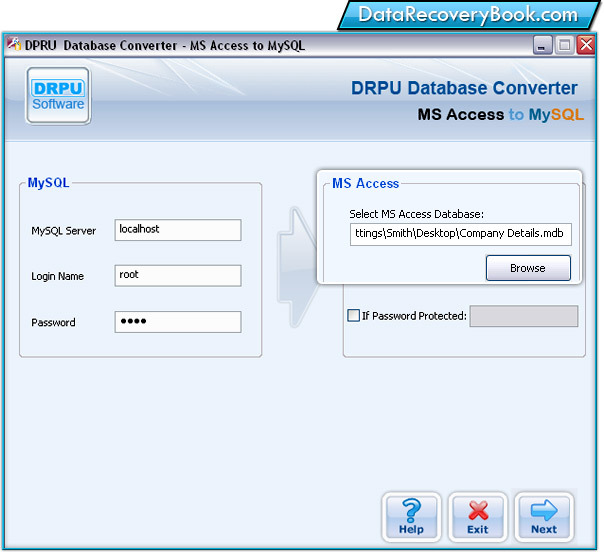 MS Access to MySQL Database Converter Software easily and instantly converts database records build in Microsoft Access to MySQL database server in just a few clicks. Database converter software supports all Default values, Null values, Entities, Attributes, Tables, Records and all key constraints such as Primary key etc while creating MySQL database records from Microsoft Access file formats. Software do not change or modify the source MS Access files while converting into MySQL database file formats, thus maintains integrity of the database files. Powerful utility even provides database conversion of password protected Microsoft Access database files while converting to MySQL database file format. Software merges or overwrites users selected database table record or entire database record of MS Access with existing database records of MySQL database server or saves at new location. Quickly and safely converts selected or entire Microsoft Access created database records to MySQL database server. Merges or overwrites converted database records into already existing MySQL database. 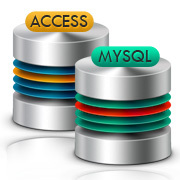 Converts password protected Microsoft Access database files into MySQL database server. Do no alternation in source Microsoft Access files and maintains the database integrity. Supports all Null values, Schemas, Entities, Tables, Rows, Database structure, Primary key etc. New streamlined user-friendly graphical interface that helps user to easily convert MS Access records. Economical and profitable application and does not require any scripting for conversion of Microsoft Access database records into MySQL database file format.